Russia's center for Syrian reconciliation has helped nearly 50,000 civilians leave Eastern Aleppo in the past two days, the Defense Ministry's spokesman Maj. Gen. Igor Konashenkov said on Saturday. While the total number of civilians evacuated from Eastern Aleppo over the past two days stands at almost 50,000, Saturday alone has seen over 20,000 individuals leaving the city, he said. "On Saturday, over 20,000 people have left Eastern Aleppo, and 1,217 militants have laid down their arms." The evacuation is being conducted through humanitarian corridors, organized by Moscow and Damascus. "We are warning terrorists and so-called moderate opposition militants, and we are addressing their patrons, to not provoke the situation, to not open fire on civilians leaving though the humanitarian corridors," Konashenkov said. The spokesman appealed to those countries and organizations which vowed to provide humanitarian aid for Aleppo. "We are appealing to those who have been for months announcing their readiness to send humanitarian aid to Aleppo: the representatives of the United States, Britain, France, Canada, the European Union and international organizations… It's time to back up your promises." Konashenkov said earlier on Saturday there was a "continuous flow" of people fleeing the rebel-held eastern part of Aleppo to that controlled by the government. 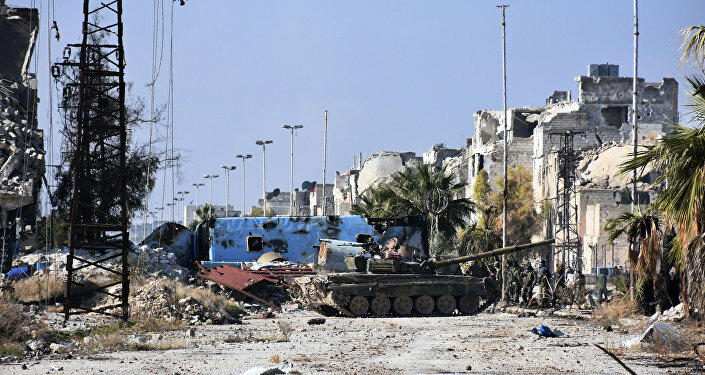 The Syrian Army on Saturday suspended its offensive against the militants in Aleppo for the time of the evacuation of civilians from the eastern neighborhoods of the city through humanitarian corridors launched by the Russian Reconciliation Center. The Syrian government has regained control of 93 percent of the city. Aleppo has become the battleground for violent clashes between the government forces and opposition groups, with the latter holding on to a number of districts in the east of the city. The siege of Aleppo has resulted in many of its civilian residents lacking food and basic necessities, their lives threatened.